Korean radish, mu, is sweet and juicy these days! Make some soup with it. While the radish soup (mu guk) made with beef is more common, this doenjang (Korean fermented soybean paste) based radish soup, called mu doenjang guk, is light yet full of flavor. Doenjang guk is most commonly made with anchovy broth, but I used vegetable broth here. It’s vegan! Simply boil some basic aromatic vegetables, such as onion, garlic, scallion, dried kelp (dashima) and dried shiitake mushrooms -- all common ingredients for making Korean broth. I thinly sliced and reused the boiled mushrooms in the soup, adding a meaty texture to the soup. To make the broth for a doenjang based soup or stew, always start with the water used to rinse rice, ssalddeumul. 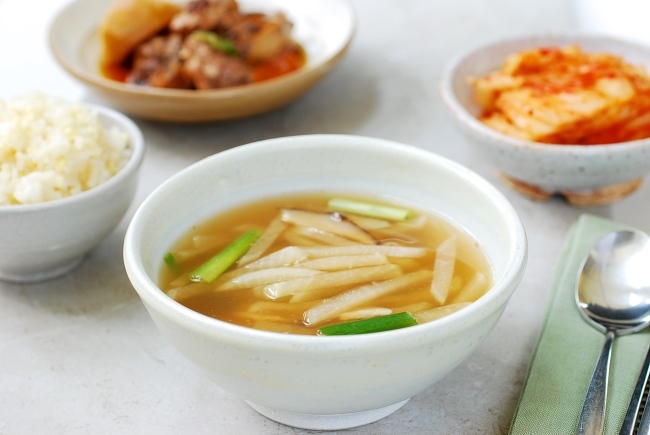 The rice water adds starch to the soup and works as a binding agent between the soybean paste and the broth, while enhancing the flavor of the doenjang. If you don’t have it, stir-in a teaspoon of flour or rice flour. Also, this recipe uses a couple of dried red chili peppers when making the broth, which adds a hint of spiciness without gochugaru or gochujang. The soup turns out light and clean this way! Add the water to the pot along with all of the broth vegetables. Bring it to a boil over high heat. Reduce the heat to medium, and boil, covered, for 10 minutes. Cut the radish into thin disks, and then into slightly thick matchsticks. Remove the aromatic vegetables, and stir in the soybean paste, or run them through a strainer in the broth if you don’t want the bean pieces in your soup. Add the radish, and boil until the radish turns translucent and soft, about 10 minutes. Drop the scallions in, and boil for a couple more minutes. Add soup soy sauce or salt, if necessary, and pepper to taste.